In a landmark event for the Androscoggin Valley cultural community, Bates College and the Maine Music Society will muster an ensemble of some 260 musicians for a performance of music by Johannes Brahms, including his monumental “Requiem,” at 8 p.m. Saturday, March 31, in the Basilica of Saints Peter and Paul, 27 Bartlett St. 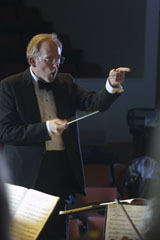 The concert is the first-ever collaboration between the Maine Music Society and the college, both key players in the cultural life of the region. Choral groups from the high schools of Lewiston and Auburn are taking part in the program, as well. Maine Gov. John Baldacci is scheduled to make opening remarks at the event. For the general public, tickets cost $17.50 at the door and $15 in advance, available through the L/A Arts box office at 207-782-7228. Admission is free to students with valid ID, but tickets are required. To reserve student tickets or for general information about this event, please call Bates College at 207-786-6135. To open the program, John Corrie, director of the Bates College Choir and the artistic director of the Maine Music Society, will lead four choirs in two motets by Brahms. The choirs are the Bates College Choir, the Edward Little High School Chamber Choir, the Lewiston High School Concert Choir and the Androscoggin Chorale, which is one of the music society’s two performing ensembles. The balance of the program consists of Brahms’ “Ein Deutsches Requiem” (Op. 45), sung by the Bates and Androscoggin choirs with soprano Bonnie Scarpelli and baritone Peter Allen, both well-known to Maine audiences, as soloists. The singers will be accompanied by a 60-piece orchestra composed of the Bates College Orchestra and the Maine Chamber Ensemble, the other performing arm of the music society. Hiroya Miura, director of the Bates orchestra, will conduct the ensemble. First performed in its seven-movement entirety in 1869, “A German Requiem” is a consistently popular entry in Brahms’ catalog. In its sophistication and complexity, the music marked a turning point in 19th-century composition. The texts, chosen by the composer from the Lutheran Bible, deal with issues of loss, consolation and a transcendent hopefulness for humanity. For more information about the Maine Music Society, please visit the Web site.